In ancient times, walls were built around cities to protect them from attacks by their enemies. 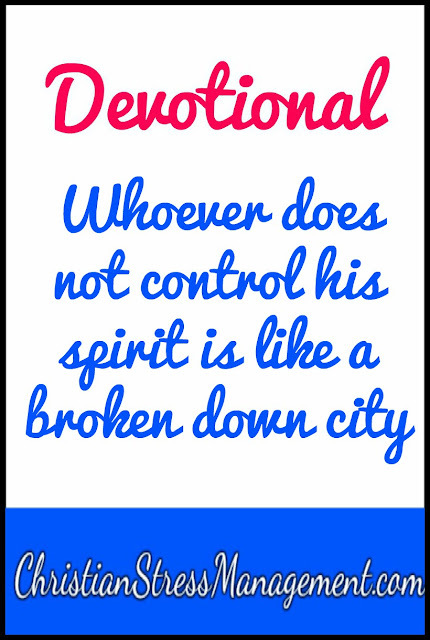 A person who does not control his spirit or in other words, a person without self-control, is similar to such a city because they cannot protect themselves from attacks by their enemies. This is due to the fact that their enemies can do things to them to trigger the responses they want. For example, the enemies of a person without self-control can leave cookies close to their desk to trigger them to eat and break their diet. Their enemies can also say the words that make them lose their temper so that they can throw a tantrum. 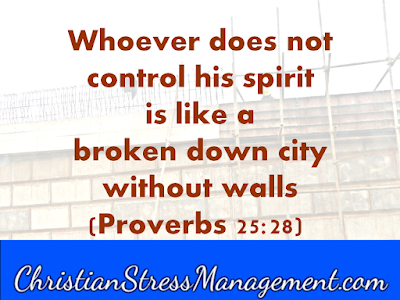 A person who does not control their spirit is therefore virtually defenseless from the attacks of their enemies. 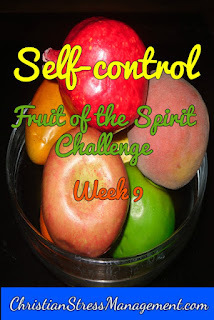 To strengthen your self-control, take the Self-Control Fruit of the Spirit Challenge. In addition to taking the self-control challenge, strengthen your control of yourself by having set goals for all the facets of your life since your goals can serve as walls that keep you on the right track. For example, if you have set a spiritual goal of going to Heaven, if your enemies tempt you to break any of the commandments, you will be less likely to succumb to the temptation if you remind yourself of your Heavenly goal. If on the other hand, you have set a physical goal of losing 20 kgs, if your enemies tempt you to eat cookies, you will be less likely to succumb to the temptation if you remind yourself of your weight loss goal. Therefore set goals for each aspect of your life and write them down. If you find that your "goal walls" are not strong enough to keep you from caving into your enemies' temptations, strengthen them by praying over them and speaking positive declarations over your life. Heavenly Father I ask You in the name of Jesus to help me strengthen my self-control so that I can live a life that pleases You rather than one that pleases the enemy. Father God help me to rebuild the broken down walls of my life so that I can fulfill the purpose you created me fulfill instead of doing what the enemy wants me to do. In Jesus' name I pray, Amen.